The art of writing a screenplay can be challenging. The aspiring screenplay writer must overcome the stress of staring at a blank screen while waiting for ideas to strike, then grapple with characters, storylines, and dialogue to create a script that will hopefully catch the attention of Hollywood producers and resonate with viewing audiences. Then excitement builds at last when the script finally takes shape and is sent off for review! But… for many writers there’s a huge letdown coming when that screenplay is returned with a rejection note saying it has not been submitted in the proper format. When my students ask about script formatting issues, I refer them all to Final Draft (a Cast & Crew Entertainment company). In so many ways, Final Draft is a tremendous resource for screenwriters. It’s a fully dedicated screenwriting software application that automatically paginates and formats scripts to Hollywood’s stringent industry standards, allowing screenwriters to do what they do best – write scripts. 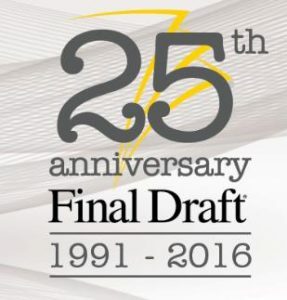 For the past 25 years, the name Final Draft has been synonymous with Hollywood film and television production. Final Draft takes a tremendous load off the mind of screenplay writers. It is an intuitive application that allows writers to simply add words, while the software takes care of the rest. Not only does it save a tremendous amount of time, money and aggravation, it makes tasks like rewriting, note taking, outlining, and organizing all much, much easier. It also offers scripts a better chance of getting serious attention paid when they are submitted. Since its inception in 1991, Final Draft screenwriting software has become the entertainment industry standard for scriptwriting the world over. 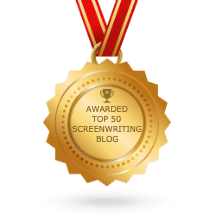 Final Draft is now in its 25th year, but continues making sure its up-to-the-minute software meets the needs of those who are interested in writing screenplays. It was awarded the prestigious Primetime Emmy Engineering Award in 2013. 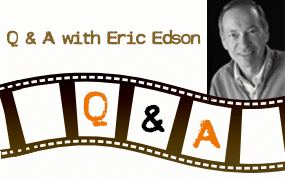 Final Draft Educational: Created especially for filmmaking schools and students. Final Draft 9 Upgrade: With new and improved scene navigator, character navigator, ScriptNotes™ navigator, character highlighting, and more. Final Draft Reader® and Final Draft Writer®: Apps for iPhone and iPad, which make creativity truly portable. The company also sponsors the important Big Break Screenwriting Contest where eleven feature genre and TV format writing winners share over $80,000 in cash and prizes, including a Final Draft®/New York Film Academy Fellowship in Writing. Visit the website at http://www.finaldraft.com for more information on automating your scriptwriting process. And a big Happy Anniversary wish to our friends at Final Draft!